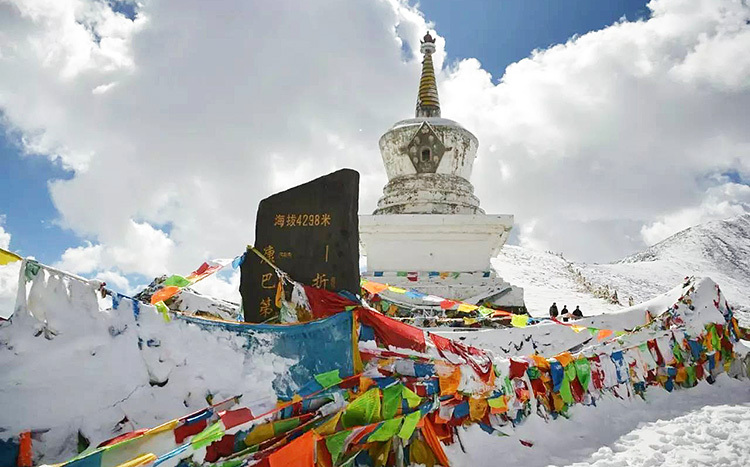 Tour Overview: Due to the strict control,it is complicated and expensive for foreign travelers to visit and even cycle in Tibet. 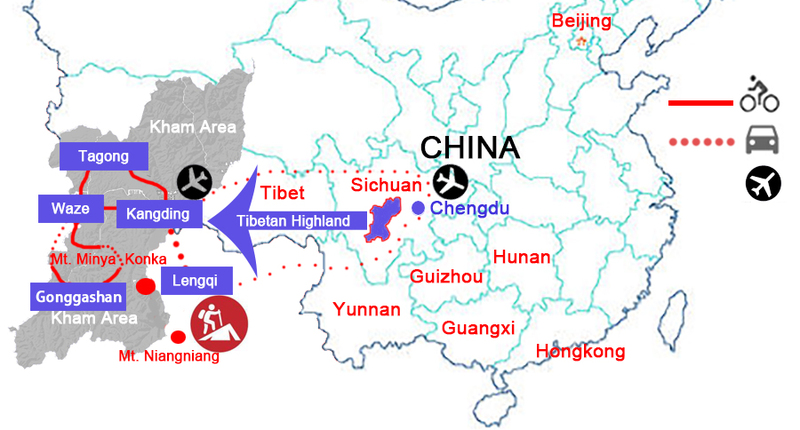 However, this tour makes your dream come true without any special permit to enter Tibetan habitat. Based on an affordable budget, you will travel, trek and cycle like a Chinese traveler. The trip covers trekking on the less-visited wild mountain of Niangniangshan, enjoying the golden/purple sunset and sunrise of the highest mountain in Sichuan province - the holy Minya Konka, challenging the longest climbs in Tibetan area, immersing yourself in the mixed cultures of Han and Tibetan people. 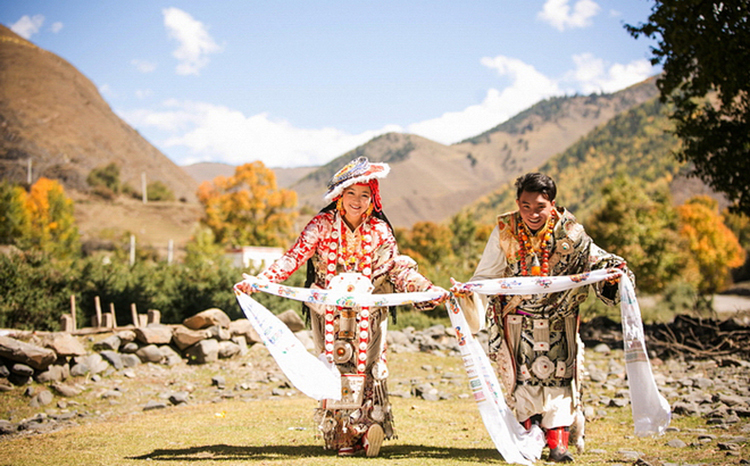 You will surely secure a special experience of lifetime in the remote Tibetan area of China! * In order to fully enjoy this tour, please make sure you are in a healthy condition without any respiratory or heart disease. You are also required to be experienced at least in medium level in long-distance cyclings. Please practise well for the highland trekking, cycling and bring own medicines for possible illness. Tour Starting Date: 25th April, 2019.Private booking for this tour is available if you have at least 2 people. Please send your enquiry. 2. Best scenery in western part of Sichuan. 3. 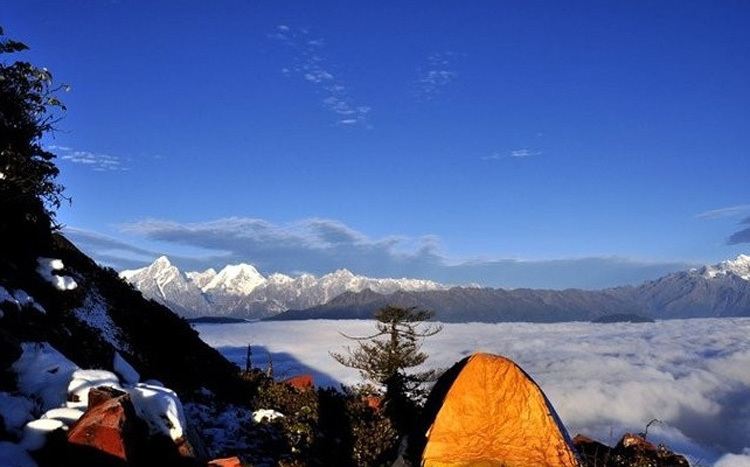 Panoramic views of the highest montain of Sichuan. Day 1 Arrival of Chengdu. Elevation: 500M. Arriving Chengdu Shuangliu airport, our guide will wait you with our flag at the exit of the airport. We will take the shuttle bus to the hotel near the bus station where we are going to continue transfer tomorrow. If you arrive very early at Chengdu, we can take the metro and simple visit some interesting part of the big capital city of Sichuan province and enjoy some local snacks. We will need to get our bus ticket this afternoon before the ticket office is closed, so please arrive at Chengdu as earlier as you can. Day 2 Chengdu shuttle bus to Lengqi Town + Warming up cycle(B L D) Elevation: 1000M. We will be on the long-distance bus for 5-6 hours before arriving the tour starting town – Lengqi, the town is very famous among the hikers in China because it is an intersection for normal visitors who wish to visit the Hailuogou Valley (means the trumpet shell valley), and Lengqi town is also famous for its super nice trekking route – the trekking/cycling of Niubeishan (the back of the ox mountain) although the mountain is now prohibited for any visitors and being developed by the government. Lengqi is a very small town with only one main street and no opportunities to enjoy fancy rooms and food, so we will stay at basic small lodge or local people’s house. Today we will see our bikes and prepare everything for the coming challenges of hiking and cycling. 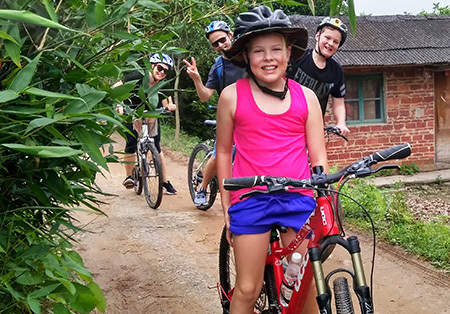 To better acclimatize the outdoor challenge on highland, we will do a cycling around 20KM today along the great river around Lengqi, maybe a short climb on bikes will also be arranged which rewards us some nice pictures with the Four Sisters Mountain and the remote villages. Day 3 Trek the Niangniangshan Mountain 15KM (B L D) Elevation: 3570M. The trekking up to the top of the mountain today is a great challenge because usually we will need about 7-8 hours to reach the summit, and if we trek with our heavy tents and sleeping bags, the expecting time of arrival to the top will be about 11 hours! You can't never imagine you are only required to hike up about 13KM in such a long time. We will be transferred with van or motor bike from the town to the foot of the mountain and our trekking starts from 2000M! The best time avoiding the raining season in this area is April, May, June, October and November. The temperature drops dramatically when we hike up, and the air on the plateau is much less than normal mountains so every step here will be slower and tougher. Niangniangshan (means the goddess temple in Chinese) is such an off-the-beaten mountain lately developed by local farmers in 2016; you will not find any related information about it on Google. The tent owner on the top offers us basic tools for camping so we only need to carry some food and waters with us for the two days’ trekking and overnight. Make a fire, waiting for the gorgeous sunset scenery and prepare well for the chilly night camping on elevation of 3500M! And hopefully you will not get sick or feel too much headache. 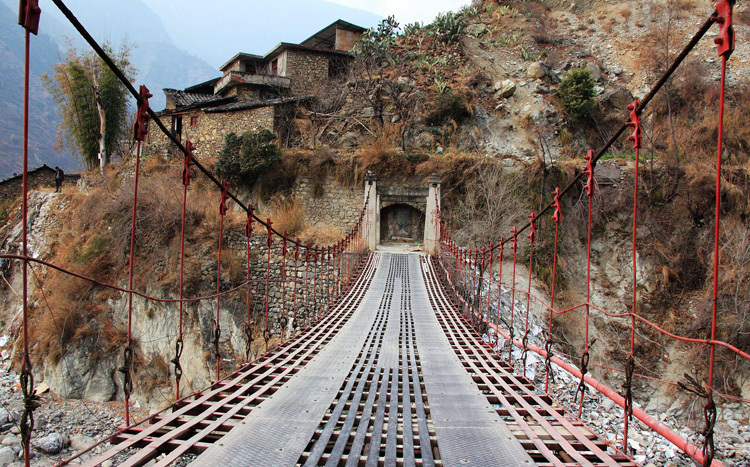 The trekking today is more difficult than the trek on Tiger Leaping Gorge, so if you are not confident to finish it, please book extra transfer service or get help with our supporting motor bike or horse, you are required to less than 1.77 meters tall and less than 80kg if you need help from the motor bike. The sunrise in the morning here starts around 7:15 in early winter, so after a ‘terrifying’ night camping, we have to get up early and warm ourselves from the fire again. The sea of clouds moving, the shadows of the light changing and we will be fully shocked by the art of true nature when watching the sun light turns from grey into golden and purple. You are not standing on the top of the mountain; you are in the picture painted with all famous mountains in Sichuan province. We have to say goodbye and trek the same route downhill although the picture of stars last night and holy Minya Konga are still lingering in our mind. A great and different view can be seen if it snows in the first day and stops in our second trekking day. After about 4 hours getting down from Niangniangshan, our car will transfer us back to Lengqi town and then head to Kangding city. Enjoy the traditional Tibetan city and have a good rest before starting another memorable day; we are going to cycle soon! You are already exhausted?! Day 5 Drive to Zheduotang and Cycle to Jiagenba Town 79KM (B L D) Elevation: 3365M. We understand the need that finishing our cycling completely is very important for a passinated cyclists. 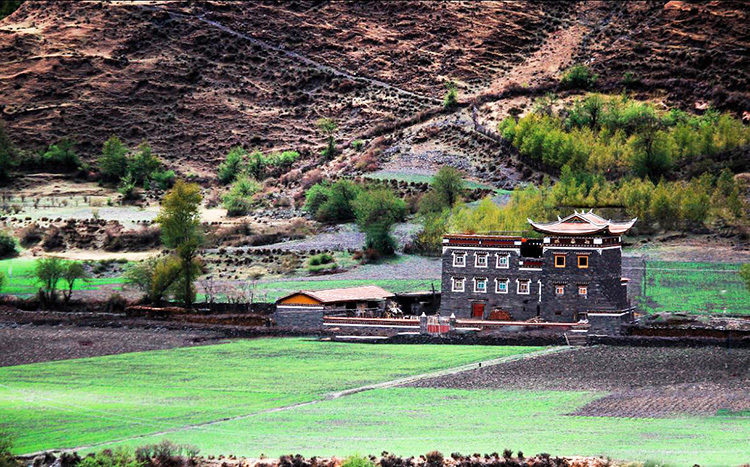 However, after great consideration, we have decided to avoid the first part of busy road outside Kangding and the heavy traffic and start the cycle on the half climb of the famous Zheduoshan Mountain(known as the first door separates the Majority Han people and Tibetans). 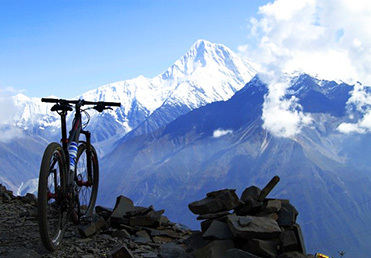 We will get our first feel for riding at an altitude of 3000-4000M as we pass through the last 15KM climb on the mountain before reaching the holy and gorgeous top of Zheduoshan (means a mountain with lots bending). 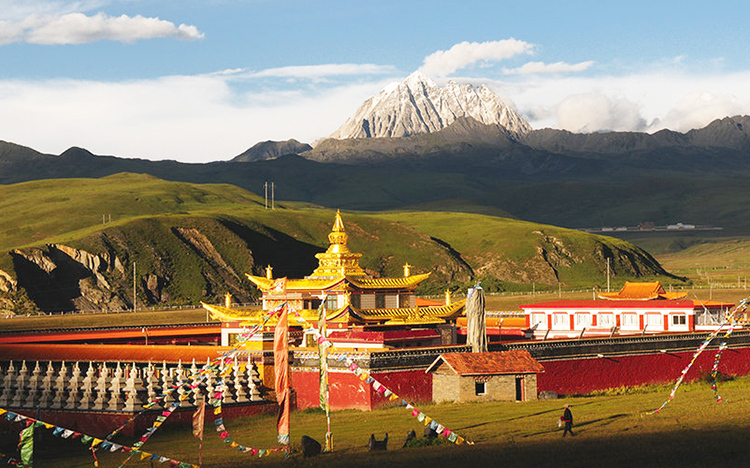 The stunning view as we descent is of perfectly paved roads flanked by the towering peaks, typical grassland, brooks, yaks and traditional Tibetan wooden houses. The rest cycling today after the big climb are easy as the altitude slightly down or completely flat. Day 6 Jiagenba Cycle to Gonggashan Town 73KM (B L D) Elevation: 3533M. Day 7 Cycle to Tagong Pasture 42KM (B L D) Elevation: 3720M. The holy and hard trip to the Mt. Gongga (Minya Konga)ends from today, after a few distance cycling downhill back to the town where we rested the day before yesterday, we will transferred back to the turning point with the van and then cycle again. 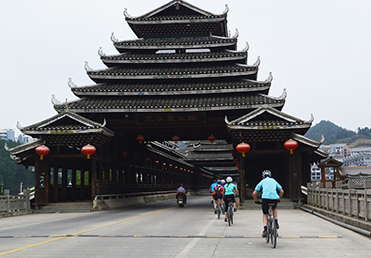 Enjoy the leisure cycle of 40KM today to Tagong town, where it is famous for its grassland, rest and recover there. We can find the dry Yak meat being sold in shops along the road, don’t forget to buy some as it is not only in good flavor but also useful for strength recovering. We will have plenty of time taking photos, and trek on the small hills and temples at Tagong town. And we are served with real delicious and nutritive Tibetan and Sichuan food. Day 8 Tagong to Kangding 92KM (B L D) Elevation: 2600M. 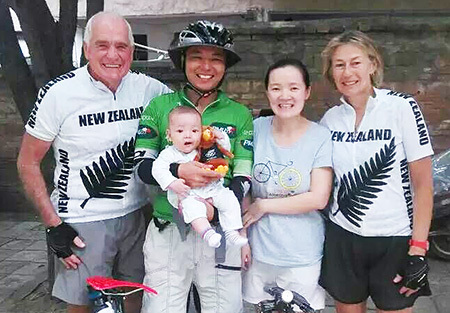 Prepare well for another cycling day without any places for lunch, we will cycle mainly on small undulating in the morning and then enjoy our last cool downhill for the last 20KM, finishing today at the airport of Kangding. Our van will drive us and the bikes back to Kangding city. The farewell dinner today will be a real Tibetan meal full of amazing new experiences, our lovely guide and driver will help you for direction and suggestions to get some good snacks or souvenirs before rest tonight. Goodbye Sichuan Tibet, good night our dear guests. Our service ends after transferring you to the airport of Kangding city this morning, you will fly from here back to Chengdu very quickly, and catch your own booked trains or flight from Chengdu for your next tour destinations or home. Prices: per person, USD1950 (2-4pax), USD1800 (5-8pax), USD1700 (9-12pax), Single room surcharge: USD280. Supporting van is available everyday; Helmet is offered for free but we suggest bring your own ones and cycling gear. Flight ticket from Kangding back to Chengdu.